Pivotable - Can be mounted quickly and easily pivotable to the wall (portrait or landscape format). All controls remain easily accessible. Hidden wiring - Can be charged via the intern USB micro connectors without visible cables from the back side of the wall. Ideal for fairs and display stands or the smart home. Then you have one charging point for all iOS devices. Smart eye-catcher even without an iPad - No hooks, no claw fasteners, cross joint or similar fixtures remain at the wall when your iPad is on the road. Photoframe - By selecting the picture for your clip-on photo frame you determine the look of your sDock when the iPad is not there. Matching your home. Matching your office. A perfect match for you. 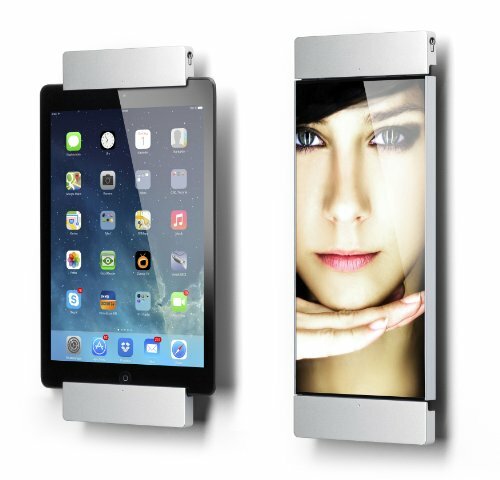 Lockable - For offices, trade fairs, in hotels or public places your iPad is protected from thieves. A lock is enclosed standardly. If you have any questions about this product by smart-things, contact us by completing and submitting the form below. If you are looking for a specif part number, please include it with your message.